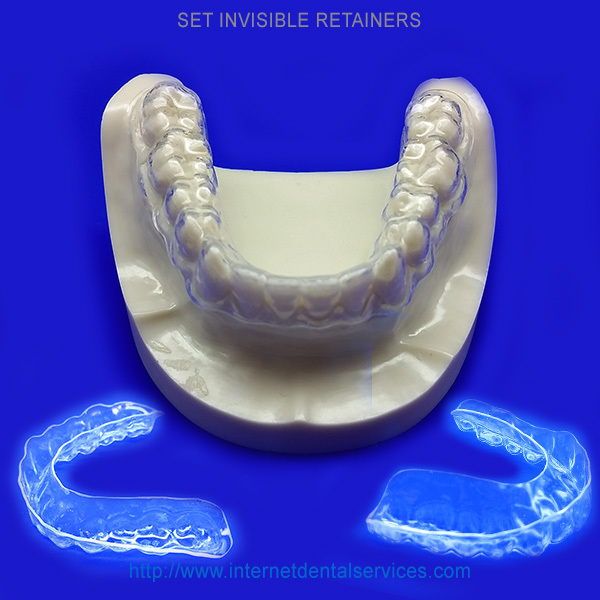 The Invisible or Clear Retainer is the most preferred retainer by patients that get their braces removed. The reason for its popularity is that it is virtually invisible. It is made of a clear plastic that fits over the top of all of your teeth and prevents your teeth from moving. The only drawback of this retainer is that is usually only last for a year. The plastic is durable but cannot hold up to the stress that the Hawley retainer can. When you order our Invisible or Clear Retainer you will receive our teeth impression kit within 2-3 days. After you create your impressions and send them back to us in our prepaid mailer, it takes 10-12 days to manufacture your product (the same time as if you had gone to a dentist). These are the same high quality products that are made by laboratories that dentist use, for close to half the cost. To clean the Invisible or Clear Retainer simply brush it with toothpaste and water each time that you take it out from that days use.